Again, the home team is listed on the bottom. At game’s end, Baltimore is a 31-20 winner. If our buddy Joe had decided he wanted a three team parlay, a possible winner would have been Detroit, the Detroit under and Baltimore. If he wagers $100 on that bet, he wins $500. Some bookies will accept four-team parlays that pay 10 to 1. It is best to only offer two-team and three-team parlays, as players will only resort to a four-team to try to and get themselves out of a hole. Rarely do a four team parlay win, and then the customer winds completely buried. With no way out, he may choose to simply not pay his debt, and you collect nothing. These are the basics for winning parlays. While you should know the odds and how their payoff works, you will write many more losing parlays, so we move on now. What defeats a parlay is fairly simple: any loss makes the entire parlay a loser. A difference between a straight bet that loses and a parlay that loses is that the parlay does not have any juice attached to it. 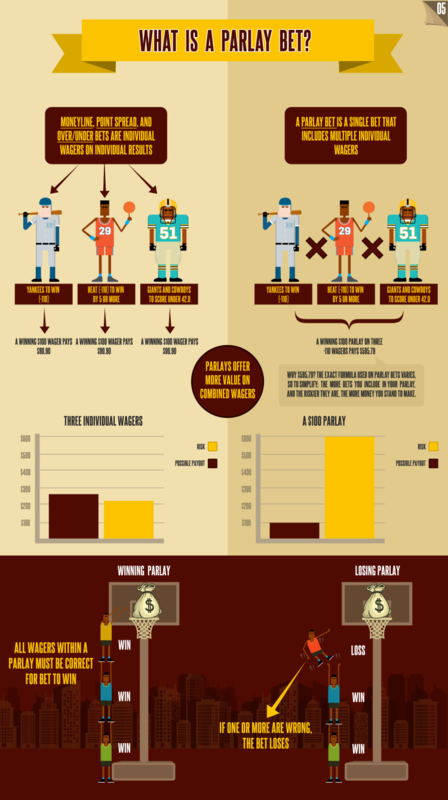 Casinos and bookies want to attract as much action as possible on parlays; as incentive, a $100 parlay that loses will only cost the gambler $100, no matter if it is a 2-team or a 3-teams. The reason bookmakers love their customers to play parlays is because it is one of the worse possible sports bets a gambler can make. With a 2.6-1 payoff, a two team parlay may seem like easy money to the gambler. However, the real odds of betting on two teams in a parlay and having them both win actually 3-1. The difference is paying only $260 on a bet that should pay $300 may not seem like much, but consider that it is a house advantage of almost 14 percent. There is even more advantage to the bookie in the three-teamer, which pays 5-1. The true odds there? Seven to one, yielding a whopping 29 percent as house advantage. Do remember that Vegas rules dictate that it doesn’t matter if the customer loses one, two or all three of the bets in that parlay. He only loses the $100, no juice, no vig. Amazingly, as much as the parlay is already in the favor of the bookie, some amateur bookies think only of “now money” – the “today dollar” and do other things like charge juice or double juice or, still worse, take away a half-point from each of the sides or totals involved in a parlay. Conduct your business as a business and show courtesy and professionalism, and you will have all of those bookies’ customers asking to put on with you. Have faith. As mentioned earlier, gamblers tend to find other gamblers and won’t hesitate to leave a bookie who steals from them. What about a tie in a parlay? If a customer had bet a three-teamer and he wins two and the third ties, the parlay then drops down to a two-teamer and pays 2.6:1. Again, any loss makes the entire parlay a loser, so he could have tied two of the games and lost the third and he still loses the bet. if the customer had placed a two-teamer and he wins one and ties the other, the bet pays off at .92 per dollar wagered and so should you.